Party balloo ns, elastic waistbands and the universe – for some things, expansion is easy. When your home is too small, however, it’s not always possible to expand it. Whether you live in a suburban townhouse, an urban condo or a big, modern single-family home on a tiny lot, chances are good expanding just isn’t in the cards for your home. Many Americans are in the same situation, and they’re seeking creative ways to maximize the utility of the space they have. A before/after video of a Charlotte, North Carolina home illustrates the dramatic difference simply adding skylights can make. Visit https://vimeo.com/176301240 to view the video. Add solar-powered blinds in designer colors and patterns to solar skylights, and you can control the amount of light entering a room with the programmable touchpad remote control. Even more – homeowners can receive a 30 percent federal tax credit on solar skylights, blinds and installation costs. For rooms without direct roof access, another option could be Sun Tunnel tubular skylights that funnel natural light from the roofline into spaces below. These models also have optional light kits that make them functional 24/7. 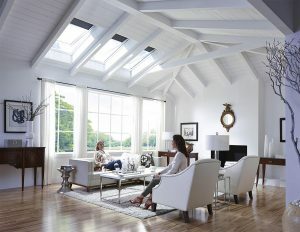 Visit www.whyskylights.com to learn more. Finally, it may be possible to remove a non-load-bearing wall between rooms to create a more open space. For example, if your kitchen is partitioned off from the family room, removing the wall between the spaces – or even half of it – can make both feel bigger. Have an unused bedroom adjacent to your master bedroom? Removing the wall between the rooms can give you an impressive master suite. Finally, use the space you do have more efficiently by designing rooms that multi-task – such as a home office/guest bedroom combination or guest room with the closet converted into a work space. If you’re like most Americans, you store stuff in the garage. Adding organized storage such as shelves and cabinets can help optimize the space and maximize the amount you can store there.